Canvas stretchers stacked amongst old paintings, next to boulders and rubble; then a few sunflowers covered in shellac, and developed film wrapped around paper rolls are mixed in between the tower of paintings, lead, stones, and dust. Does it seem overwhelming? This is not the aftermath of an explosion in an artist studio, but Anselm Kiefer’s “Ages of the World”, the central installation designed for his exhibition at the Royal Academy. It is so fresh that the earthy odour of the rocks, and the powerful aroma of the oils emanate from the totem pole like masterpiece. This is the first time that so many of the German artist’s works have been put together in the UK. Spanning from his early water colours made at the end of the 1960’s to his 2014 mixed media paintings, which were especially created for the Royal Academy, the show explores his over 40 year long career. Curator Kathleen Soriano says in an interview for the RA that it is 60 per cent retrospective and 40 per cent new pieces. Soriano believes that he is the greatest living artist but is she forgetting David Hockney, or Damien Hirst? Kiefer is a hyperactive and very creative artist, who has made books, photographs, sculptures and has even constructed buildings out of reclaimed shipping containers, but it is in his paintings where his talent truly comes alive. Despite being called paintings, they are really colossal mixed media masterpieces. Some of them being larger than a regular sized bedroom, “Ash Flower” for example, which expands over seven metres wide and four metres tall, cosily claims an entire wall in room three of the vast gallery. “Ash Flower” made between 1983 and 1997, with oil, emulsion, acrylic paint, clay, ash, earth and a dried sunflower placed vertically and upside down in the middle of the painting, is a representation of the grand Mosaic Room in the Reich Chancellery, Berlin one of the buildings commissioned by the Nazis to promote National Socialism. But the room has been turned into ruins by the addition of ash and earth all over the canvas, some sections actually resemble wall-paint flakes falling off the walls, and what would be the floor tiles, becomes 3D when the painter includes pieces of red cracked clay at the lower section of the canvas, giving it an extra layer of texture and finished with the encrustation of the gigantic four metre tall dry sunflower dead in the middle. From his very early works, we are exposed to his provocative material. 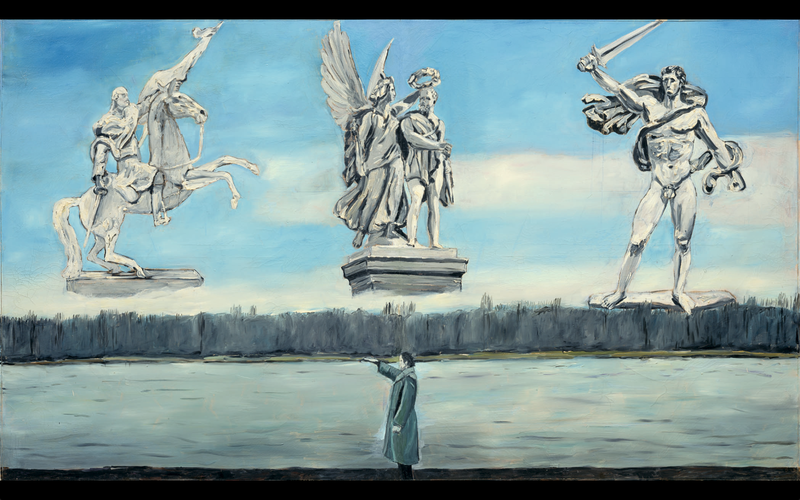 The “Heroic Symbols” paintings from the 1970s, made in the belief that one must confront rather than suppress the experiences of history, are a series of self-portraits where he paints himself wearing his father’s German army uniform and doing the Nazi salute. All the way to his latest paintings, “the Morgenthau” series, where he refers to the 1944 US plan to transform Germany into a pre-industrial, agricultural nation. This beautifully crafted collection can make any colour lover, expressionist aficionado, or mixed media enthusiast feel that their £15 worth of ticket was well spent. These series contain some of the most striking works of the exhibition. Blues and turquoises, mixed with blacks and golds, burst of colourful paint and textures achieved by his unique combination of available objects. He starts by submitting photographs to a process of electrolysis, leaving the sediments on and layering up by the addition of oil, acrylic, shellac, volcanic stone, straw, gold leaf, even a pair of shoes are included in one of the paintings. A hunting trap right there in the middle of straw branches and gold coloured skies, is a little reminder that no mater how vivid or arresting his work can be, the meaning of war remains in place. Throughout his works, a couple of other themes appear and there are elements that reveal the influence that artists such as Van Gogh have had on him. 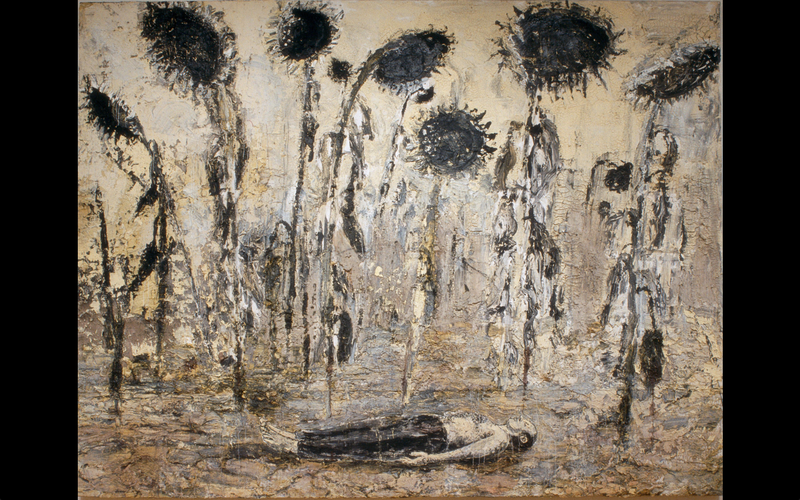 The presence of sunflowers in many of his works is an example, but where Van Gogh portrays his sunflowers vividly, Kiefer’s are dead and often blackened, or sometimes only leaving the seeds exposed. 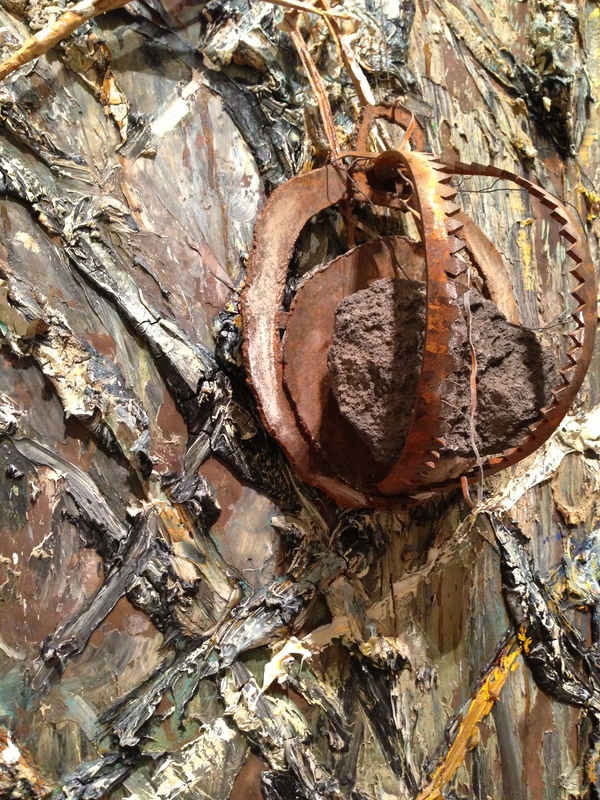 Another example is his strong interest in astronomy, where Van Gogh created the bright Starry Night, Kiefer using lead, which he believes it is the only material heavy enough to carry the weight of human history, forms enormous lead canvases and inserts diamonds onto them, along with broken clay, paints and silver leafs, he achieves a fascinating embodiment of the sky. He is the living illustration of the phrase one man’s trash is another man’s treasure. He likes to reuse elements that withstand the test of time, and understands the potential for art to outlast the life of the artist. It is clear that he is concerned about regeneration, changing the meaning of things, by taking something derelict and giving it a new purpose. Is he trying to remind us, that we are only a small part of our ever-expanding universe? I certainly felt bewitched and bewildered when staring at his astronomically large paintings.